Ever wanted to play music in a Discord channel for others to hear? For free? Whenever? Playing music in Discord through a microphone. Playing music via a secondary Discord account’s input on a second instance of Discord. Letting Discord music bot do its thing. Following are the guides for setting up these 3 ways of playing music in Discord. Do note however that the quality of the music played through mic is not ideal in Discord voice channels. We can do that without having a mic. We can do that with a microphone all the while being able to speak through it at the same time. Here’s a step-by-step TUTORIAL that covers them both: how to play music through mic using VoiceMeeter and a soundboard (links to another tutorial post). Simply use Discord as the voice application (pictures below). Whatever we set as CABLE Input will be mixed up with mic audio signals and then played through VoiceMeeter Output that acts as a virtual microphone. By lowering the Input Sensitivity all the way, Discord picks up on the music even at lower volumes. If you increase this, music has to be louder for Discord to pick up on it with no weird cuts and pauses. 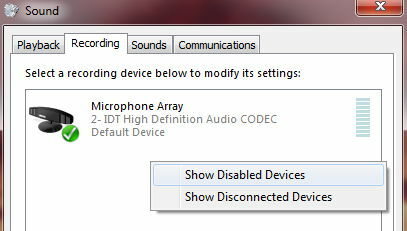 By disabling these 3, the quality of the sound coming from the virtual microphone playing music (VoiceMeeter OUT) will be slightly better. It’s a very flexible method, so read through the tutorial to get a better understanding of what it is and how things work so that you can configure things the way you want them to work in case you wanted to change some things. IMPORTANT to note: the quality of the microphone audio in a Discord voice channel will likely not be ideal. A discord voice channel’s audio quality can go up to 96kbps (64kbps by default) while most the music tracks are usually 320kbps. Because of that, the quality of music played through a microphone in Discord is usually lower than the original. First off, you may be be wondering: why have a second account on a second instance of Discord for playing music? Why not use the 1st method instead? There actually are good reasons for this. Maybe you didn’t want to be associated with the account that’s playing music, maybe the technical fidelities didn’t sit with you or maybe you just were curious enough to try a new thing. Whatever the reason, let’s have a closer look first and then see how to set it up. We’ll run 2 instances of Disocrd with 2 seperate Discord accounts. One instance with your main account with its own input and output settings and the other instance with your second account that acts as a music player with its own input and output settings. We’ll use a virtual audio cable that acts as a virtual microphone for the secondary instance of Discord for playing music through it. I’m assuming you already know what Discord is, why and how it’s used. So let’s get right in to the tutorial. IMPORTANT to note: microphone audio quality in Discord can be up to 96kbps, most channels have it at 64kbps which is the default one. To put it in to perspective, your average music file has a quality of 320kbps. You will notice the difference in Discord – it’s not an ideal quality for enjoying a music piece, but that’s the best you can get when you don’t have the neccessary permissions in a given Discord server to set up a music bot instead. The following tutorial is ultimately derived from this tutorial: how to play music through mic using virtual audio cable and a soundboard (link opens in a new tab). Download and install VB-CABLE Driver (links to the download page, opens in a new tab). It’s an audio driver that acts as a virtual audio cable we’ll be using as a virtual microphone on the secondary account on the second instance of Discord. 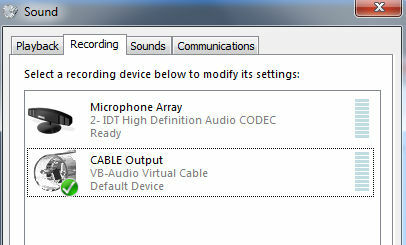 Enable both CABLE Input and CABLE Output in Sound settings. 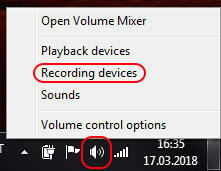 In the pictures below, it shows how to enable the CABLE Output under the Recording tab only, so you have to do the same thing under Playback tab, but don’t make CABLE Input the default device. 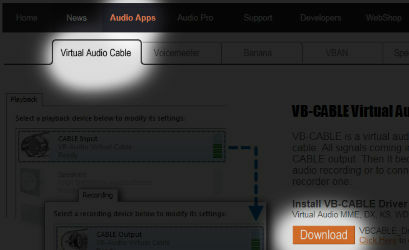 Instructions for downloading virtual audio cable. Create a new Discord account. This will be the secondary account that we’ll use to play music with. Run one instance of Discord in the Desktop App using your main account and the other instance of Discord in a Web Browser using your secondary account. 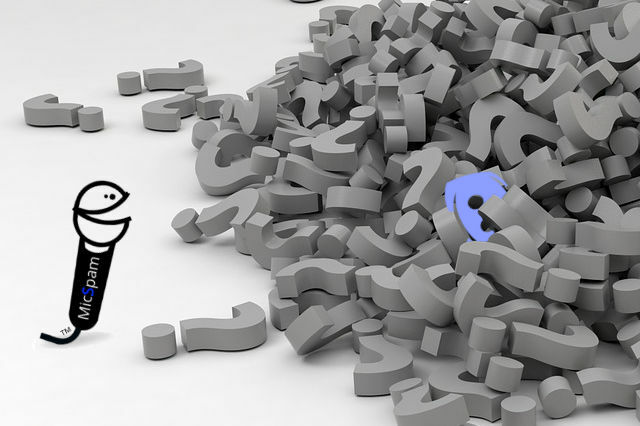 Pick your secondary instance – is it the desktop version or the web browser one? Once chosen, set its input to be CABLE Out. That way whatever is played through CABLE Input plays through the output as if it was a microphone in the secondary Discord. Configure the voice settings in Discord to maximize the quality of the audio/music. Discord input device is set to be CABLE Output (virtual microphone). To maximize quality of the audio coming through the virtual mic in discord, sensitivity is lowered all the way. 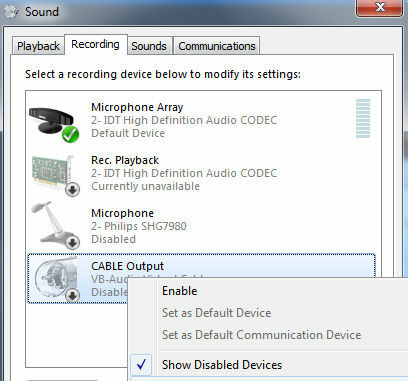 Disabling these voice processing features may or may not increase the quality of the audio playing through the virtual mic. Set the audio source for CABLE Input. It can be any configurable audio source. A media player, a soundboard, etc. I used Windows Media Player as the audio source and made it play through the secondary account while listening to it through the main account. 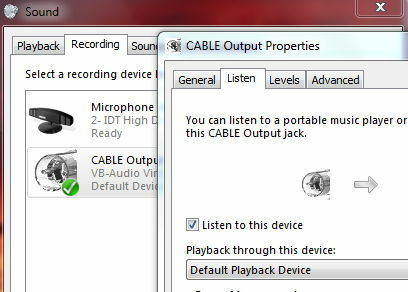 Sound goes into CABLE Input from Windows Media Player and is transmitted in Discord through CABLE Output on secondary account. You should be able to join a Discord channel and play the music from the secondary account, opt for listening to the music directly yourself by ticking “Listen To This Device” in CABLE Output property settings or by listening in on it with your main account by joining the same voice channel the seconday account is playing music in. Note that the “Listen to this device” is ticked – if it’s ticked, you can hear the original sound playing through the virtual microphone (CABLE Output) directly yourself if it’s set to play back to your headphones. It will be of lower quality in Discord because of Discord lower quality. There are lots of well-documented bots available, so I’m a little confused how you ended up here for this. Is it that you were hoping to find a way of setting up a music bot without having the neccessary persmission in a Discord server? I’ve probably searched as much as you have – I think it simply can’t be done without sarcificing the audio quality. But I also couldn’t find such a bot with sacrificed audio quality as mentioned. Plain old manual methods are the way to go for now. Either opt for the first 2 options I outlined or follow any one tutorial available from the internet on how to set up a music bot in discord that requires you to have certain permissions in the Discord server. There are lots of them. Sorry for meeting you half-way only with this last one. At the least, perhaps, I put your mind at ease by confirming what you too might have thought, that without those permissions one can’t have a Discord music bot.